All this talk about Tea Parties has been making me obsess over a proper Afternoon Tea. Luckily for me, my dear friend Orna became a Grandmother this week, and this happy occasion provided the perfect opportunity to polish up the silver. For me, there is no more delectable menu. Without a doubt, it is a bit labor intensive, but the results are worth it. Afternoon Tea (don't say "High Tea") is three courses. 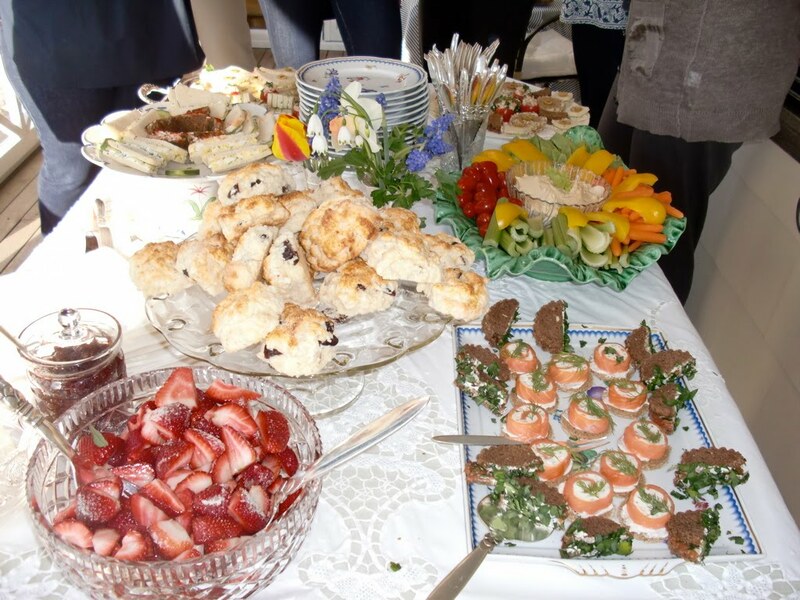 First sandwiches, then scones with clotted cream and jam (and strawberries if you like.) Finally cake or pastries. If you can't find it you can substitute Creme Fraiche, or whip a cup of heavy cream, and mix in 1/3 cup sour cream and a Tablespoon or so of powdered sugar. It won't be the same as real Devonshire Cream, but it will do in a pinch. Mix flour, baking powder, sugar and salt in a large bowl. Cut in butter using a pastry blender or rubbing between your fingers until it is in pea sized lumps. Stir in the cherries. Mix together 1/2 cup milk and sour cream in a measuring cup. Pour all at once into the flour mixture and stir gently until just blended. Turn out onto parchment, and knead two or three quick turns just till dough comes together, DO NOT overwork the dough. It is ok if there are still lumps of butter. With floured hands, gently break the dough apart and pat into golf-ball size portions. Place onto parchment lined baking sheet, and flatten lightly. Let the scones just "kiss" each other. Whisk together egg and 1 tablespoon of milk. Brush the tops of the scones with the egg wash, and sprinkle with coarse sugar. Let them rest for about 10 minutes. 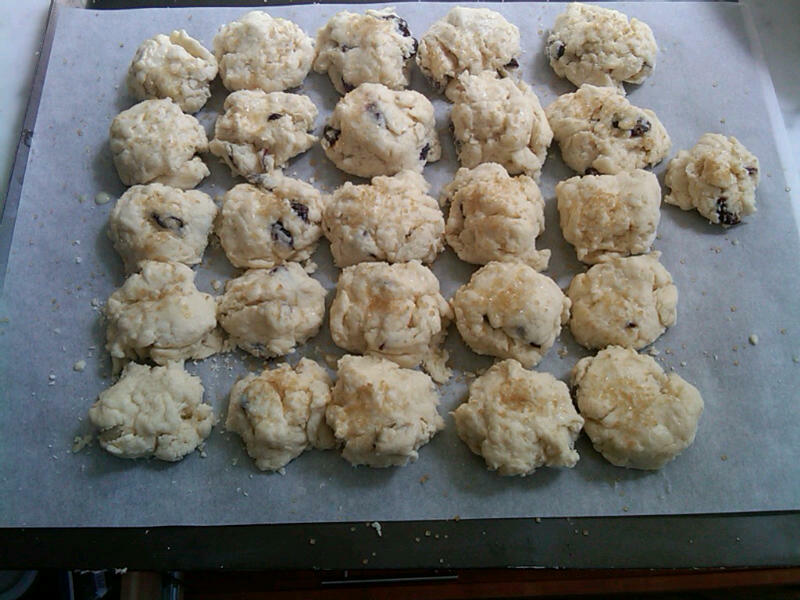 At this point, you can put the baking sheet of scones into the freezer until solid, put into heavy zip lock bags, and have them on hand to bake up whenever the opportunity for a tea party presents itself. Bake for 10 to 15 minutes in the preheated oven, or until the tops are golden brown, not deep brown. Remove to rack to cool, or if serving immediately, wrap loosely in a cloth napkin in a basket. these were the best scones i have tasted and i have tasted quite a few! What an amazing celebration it was!